Every holiday season is quite hectic. There are parties with large gatherings from Thanksgiving through the New Year. But as we wind down, there is always a light dinner with good friends to relax and enjoy cocktails along with tapas dishes. This year it will be hosted at my house. Everyone brings his or her favorite dish. There is always a nice variety of tapas dishes and this year I wanted to do something unique and different. When our latest sponsor sent us Wild Hibiscus Flowers in Syrup, I had a feeling I needed to sear some spicy scallops and make a risotto. Who doesn’t want sweet and spicy? I had fun adding some Togarashi to the seared scallops to give them a bit of a kick to complement the beautiful Wild Hibiscus Flower risotto. This dish is beautiful and full of flavor. It is easy to prepare and your guests will be delighted! For the Risotto: Bring the water to a boil and reduce heat to allow the water to simmer. In a large skillet, heat the olive oil over medium. When the oil shimmers, add the onion and sauté until the onion is translucent, but not starting to brown. Approximately 3-5 minutes. Add the Arborio rice and stir to coat with the oil and onion. After 2-3 minutes, the rice should start to “toast”. By that I mean the rice will cook slightly and become fragrant. Add the wine, white pepper and salt. Stir to completely coat the rice. Now it is time to add 1/2 cup of water at a time, and stir continuously until all of the water is absorbed. After about 15-18 minutes, taste the risotto for texture. You are looking for the risotto to have an al dente texture, just like pasta. Continue to add small amounts of water until you have this texture. As soon as the risotto reaches al dente, remove from the heat and gently stir in the hibiscus flowers, and if you like a little more sweetness, a bit of the Hibiscus syrup. Loosely cover the pan with foil and set aside. For the Scallops: Mix the sesame seeds and Togarashi seasoning in a shallow bowl. Togarashi is a pretty spicy Japanese seasoning, and I would recommend tasting before you add too much to the sesame seeds. Heat the butter and olive oil a medium skillet over medium-high heat. Adding oil to butter prevents the butter from burning too quickly. Press one side of each scallop in the sesame seed mixture and place in the skillet seasoned-side down. Sear the scallops until they develop about a 1/4-inch “crust”. About 2-3 minutes. Turn the scallops over and reduce the heat to medium. Continue to cook until the scallops are cooked to your desired temperature. I prefer my scallops to be medium at most. This will take another 3-5 minutes. Place the scallops on a small warm plate and season with flaked sea salt if desired. To Serve: Divide the risotto between 6 appetizer plates. I selected a medium-sized ring mold to create a beautiful presentation. 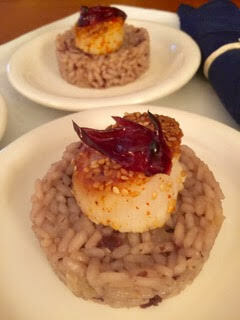 Top each serving of risotto with a seared scallop and garnish with a slice of a Wild Hibiscus Flower.